With Baby S due to arrive any day now in the next couple of weeks (!!!) people keep asking us if we’re “ready.” Ha! Is anyone ever truly ready? I just answer that I suppose we are as prepared as two first-time parents can be, or that at least our home is ready to welcome him and that we have everything we think we’ll need so far. The home we rent here in Richmond is the largest space we’ve ever shared together, but with baby on the way we’ve started to feel quite crammed in. At only around 1050 square feet, we have a large flowing living space/kitchen/dining area, one bathroom, and three bedrooms, one of which is half the size of the other two. We used to use the smallest room as a guest room and it fit a full size bed, small bench, and bedside table just fine. The second medium-sized bedroom was used as our office, with both of us spread out with desks on opposite sides of the room and plenty of space to spare. When baby was surely coming I immediately wanted to switch these two spaces, because otherwise we wouldn’t have had room for any furniture for him. This has made our home feel even smaller and more cramped than before, with our two desks crammed in the small room along with bookshelves, printers, and all of Dan’s other tech things piled up around him when he works from home. This meant that the nursery would also need to serve as our guest room, because the second bed really needs to stay here for when my mom comes to help us when he arrives. Baby S will probably stay in our room with us in his bedside Bassinest sleeper for quite a while anyway, so it should work out. Hopefully we’ll be moving into a larger space in the spring. We’re making the best of the space we have for now, with the knowledge that this setup won’t last too long. As far as decorating goes, I knew I wanted to print some of my own photographs from our time living out west to hang in his space. Because of that we ended up adding little desert-themed touches, like the cactuses on his dresser and the cute cactus sheets. This lead us to using pops of green for accents everywhere. The photos above his dresser are from our time in Sedona (left) and of Joshua Tree National Park (right.) The one above his crib is also of JTNP. 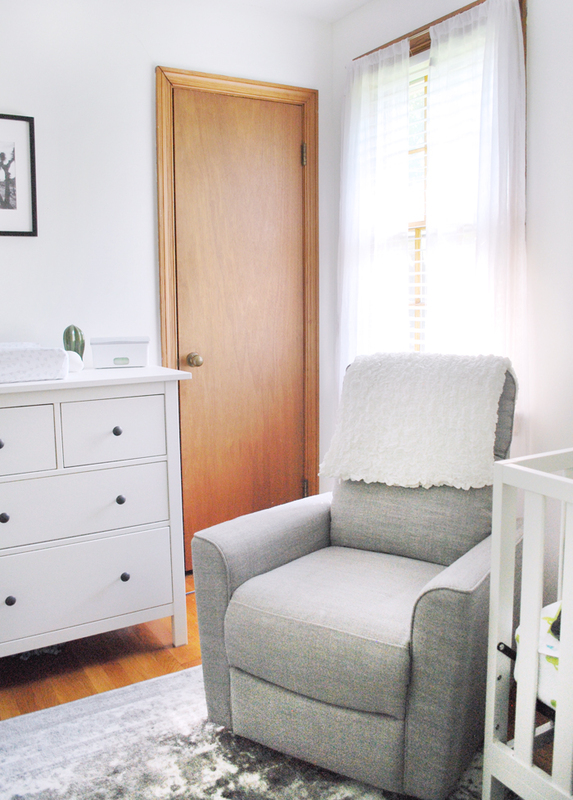 The dresser is perfect for use as storage space and his changing table. 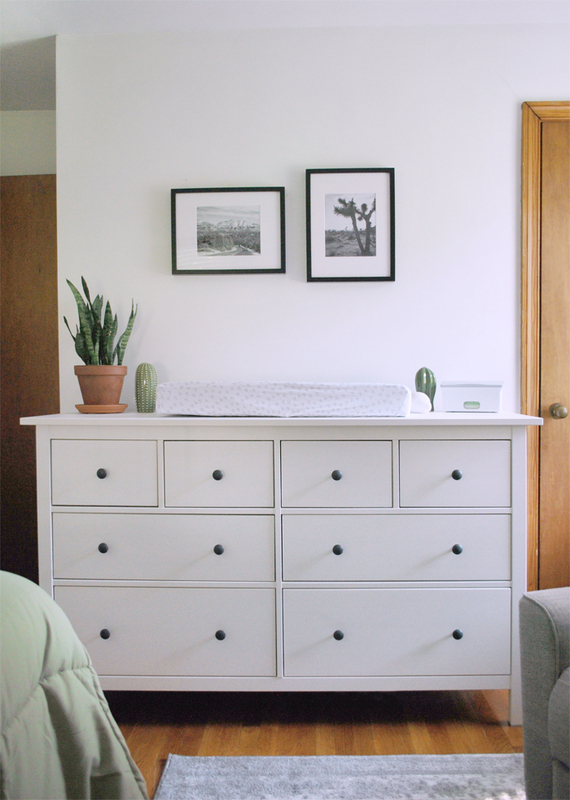 The dresser is the ever-famous Hemnes dresser from Ikea, which you’ll see all over Pinterest if you look up nurseries. The little ceramic cactuses came in a set from Ikea as well. My mom and I had a blast making the drive to Northern Virginia to shop for this dresser and other little things we couldn’t leave without. I wanted a small glider for this space, but I also wanted it to come up high enough in the back to support my neck. This rocker from Wayfair fit the bill perfectly and was a gift from my parents. The only downside is that it doesn’t recline, so I’m on the hunt for a pouf that I can prop my feet on and also toss out of the way easily to save space. The little cube storage is from Target, as are the grey pull baskets. 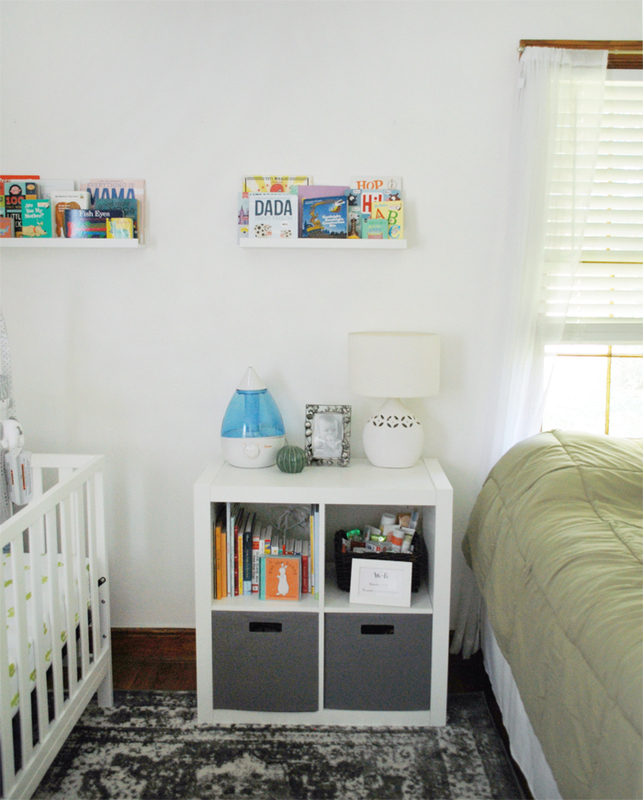 The floating shelves are from Ikea, and we’re already out of space for all of his books! I love having a bunch of them on display, but one of those grey cubes is also full of books. In one cube space you can see the “guest basket” I’ve had prepared since we moved into this house, which visitors find helpful and full of things they may need (extra toothpaste, razors, lotion, q-tips, etc.) Besides the bed, this is really the only thing that isn’t baby related in the entire space. Not shown but also in this room: the completely blank wall above the guest bed (seen better here), the basket of baby blankets on the floor between the bed and door, and the Diaper Genie that fits perfectly in that small space. Let me know if you have questions about any of the other things we have for him in here. I know I’ve missed some things, but you can probably find most of it at Ikea and Target. I can’t wait to start using this room for him! It’s all so cute! I love Love love that you used your own pics and the pops of green. Bella’s room is on the smaller side and we have ALOT of books. Our storage solution is a big basket- I’m looking for something better but this works for now. 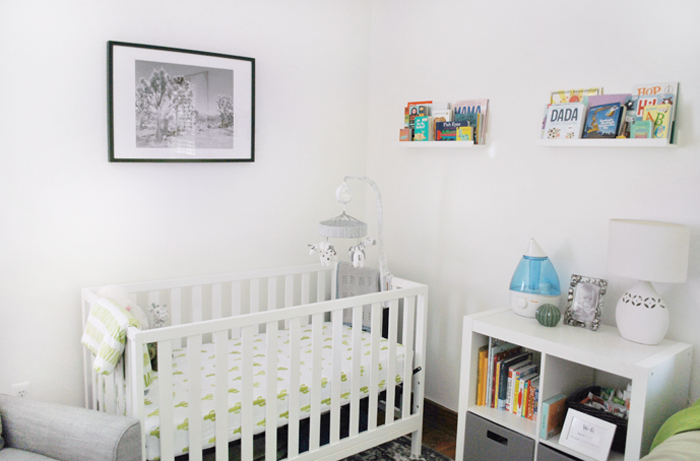 Love the nursery you created ? Thank you! Baskets are good for books because they’re on her level and she can easily pull them out herself. I imagine he’ll be pulling these off this little cube shelf sooner than later. One day I’d love for him to have even more shelf storage on his level just overflowing with books! Oh girl its stunning!! So cute. I love love the glider. You must be so excited!! I love the pops of green with the classy black and white! 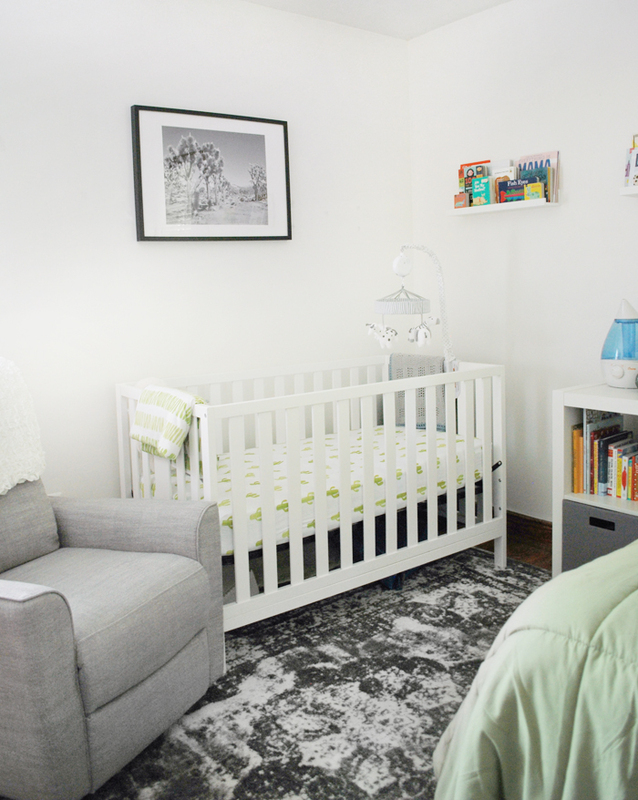 Your nursery may be small, but it’s too pretty, and I can’t wait to see your baby in there soon! Thank you! And same here…we’re so excited! What a cute room! I’m impressed at what you’ve managed with a small space. My husband and I aren’t trying for kids anytime soon, but since we’ll be in this house for 5-10 years, this is where we’ll be when a baby eventually comes. We also have three bedrooms, although the two extra bedrooms are the same size. One is the proper guest bedroom, and the other is my husband’s home office with an air mattress for the few times we need two guest beds. I’m not really sure how we’ll rearrange everything for a nursery one day!